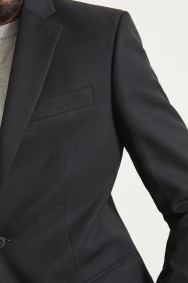 Simple and sharp – a suit you’ll reach for time and time again. 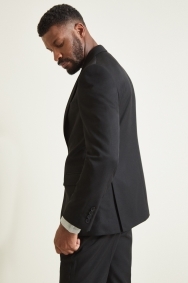 A black suit is a classic for a reason – they go with anything and make the wearer look well-dressed. 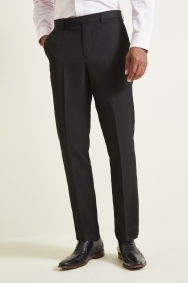 This suit by Moss 1851 is cut in a flattering tailored fit that creates shape through your waist and tapers down your legs without feeling close-fitting. 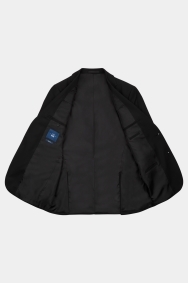 The jacket is fully lined to help it sit smooth across your body. Look the part for special occasions by wearing with a white shirt and a patterned silk tie in a rich tone. The jacket was too small and had a button missing. 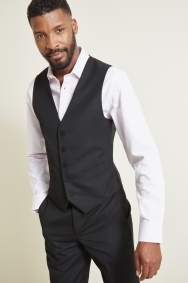 It would appear that chest measurements vary between tailored fit and regular fit!! Awesome. Great product and fast delivery. No issues. Nice suit, well priced. Fits a treat. Looks Ok for the price but it was not a 3 piece as descrtibed. Great quality, fit and value. The fit wasn't quite as I'd expected. Off the rack, everything fit quite well despite having to order a size up - with exception to the sleeves but I can have that taken care of. 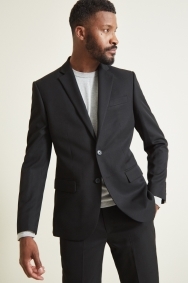 The only issue I encountered was that the suit jacket/blazer was pictured as a two-button piece whereas the one that arrived was one-button only. In the end it was not a big deal but I was disappointed that the product I received was not what was pictured. Returned this item. Tailored fit was too big a fit. Replaced with a skinny fit suit. Overall a good fit for an off the rack product. It’s the next best thing to a tailored fit suit (most people are unlikely to be able to afford a custom made suit, ha!). I got it at a great price in the sale so it worked out well. The free delivery service was next day so even better. Fairly tight across the shoulders, meaning I can't raise both arms above chest height without it cutting into my biceps. However, it fits perfectly with my arms in 'normal' positions so I still want to keep it. Quality product at a competitive price, only criticism sleeves were too long! Fits really well, its a nice feel comfortable suit ! I'm 6'1 mid build and I was surprised that it fit so well people thought I had it Taylor made ! I'm delighted with my purchase, once i purchased the bright blue suit it looked so good that i went for a black one as well. Good quality. Annoying that I have to keep typing! Great quality suit! the tailored measures are great.